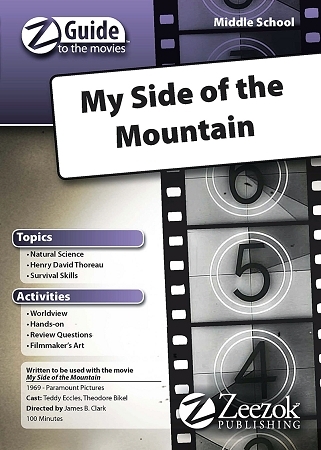 Zeezok Publishing's Z-Guide to My Side of the Mountain is a great way to incorporate media into your curriculum. Young Sam Gribley unhappy with his life in big-town Toronto yearns for a wilderness experience like his hero Henry David Thoreau. Leaving a note for his parents and siblings Sam shoulders his backpack and boards a bus bound for the small town of Knowlton Quebec accompanied only by his pet raccoon Gus. A nighttime encounter with a bear on his first day in the mountains is just the beginning of a months-long adventure that will teach Sam not only about nature but about himself. This guide contains a topic overview movie synopsis and ten learning activities based on the film. Learn more about Henry David Thoreau and peregrine falcons. Plan your own wilderness adventure. Design a suitable shelter for living in nature. Engage the whole family with a discussion section based on the movie and the learning activities. A brief bibliography lists suggested resources for additional reading and study. You've always wanted to be a rugged individualist; heres your chance to be one vicariously through Sam's experiences in My Side of the Mountain! Movie Summary: Young Sam Gribley unhappy with his life in Toronto yearns for a wilderness experience like his hero, Henry David Thoreau. Leaving a note for his parents and siblings Sam shoulders his backpack and boards a bus for the small town of Knowlton Quebec accompanied only by his pet raccoon Gus. A nighttime encounter with a bear is just the beginning of a months-long adventure that will teach Sam about nature and himself. This Z-Guide is based on the movie My Side of the Mountain (1969). You can view a trailer for the movie below.